This section is about what it is like to live with a Wolfhound and is based of my experience of the breed and my knowledge of other breeds (having lived with a pack of 6 Labradors for many years, a German Shepherd and Norfolk terriers). 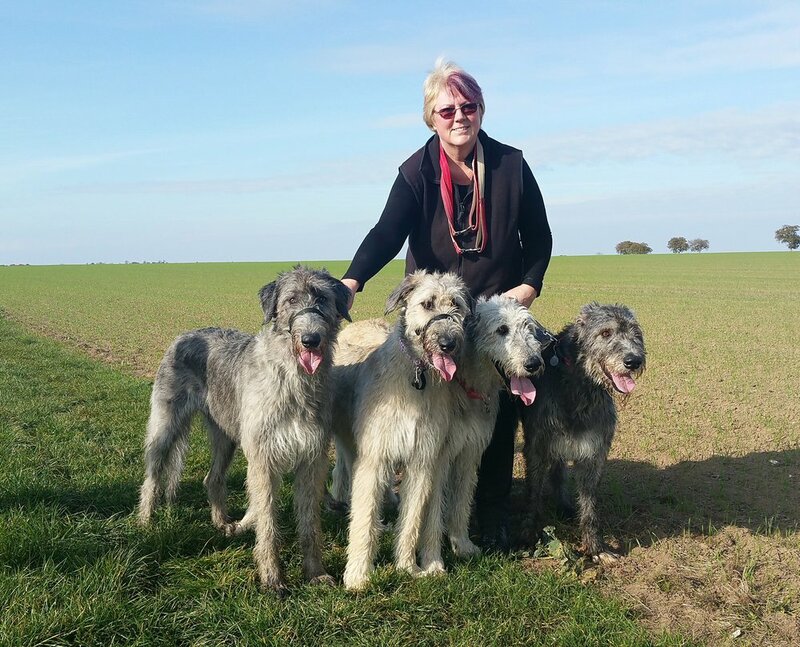 First of all I have to point out that as a family we are totally smitten with wolfhounds and indeed we have four! I have read many times in books that once you have had a Wolfhound you will definitely want another- in our case it's definitely true. They are certainly addictive! The Irish Wolfhound is a big, shaggy coated dog with a gentle nature. They are sight hounds which means they hunt by sight, they love to chase things so you must be careful when you dog is off the lead as they will chase anything that moves.His nature and temperament do not make him a good guard or watch dog and although they are alert they are not aggressive. 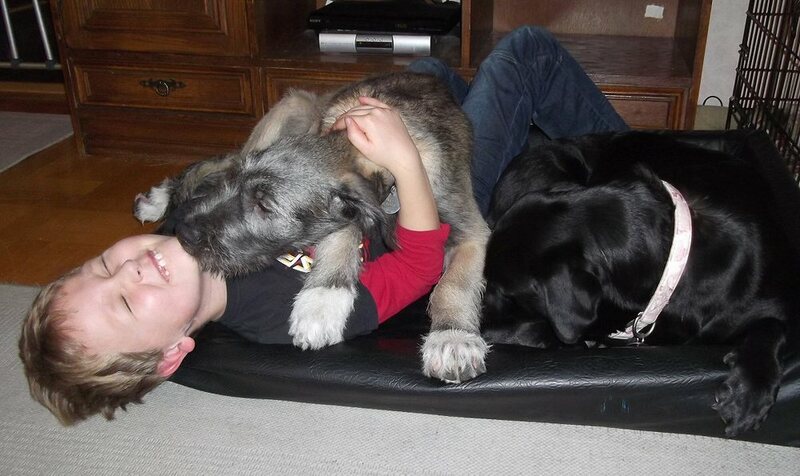 The Irish Wolfhound is a fantastic family dog, they adore children and are very gentle with them. They seem aware of their great size however they could knock over small children so care is advised. They love to be part of the family and involved in everything. They do not like to be left alone so if you work full time a Wolfhound is not the dog for you.A bored wolfhound can cause a lot of damage in a short period of time. The Wolfhound is a very social animal and does well living with another dog. They get on well with other household pets as long as they are introduced to them and understand they are part of the family. We have a pet rabbit and guinea pig and have had no problem at all. The Irish Wolfhound is the tallest breed of dog and they are big, they need space. If you take the dog in the car you need to remember, fully grown, it will probably fill the boot with not much space to spare. If you have young children who need a pushchair you will need a roof rack! 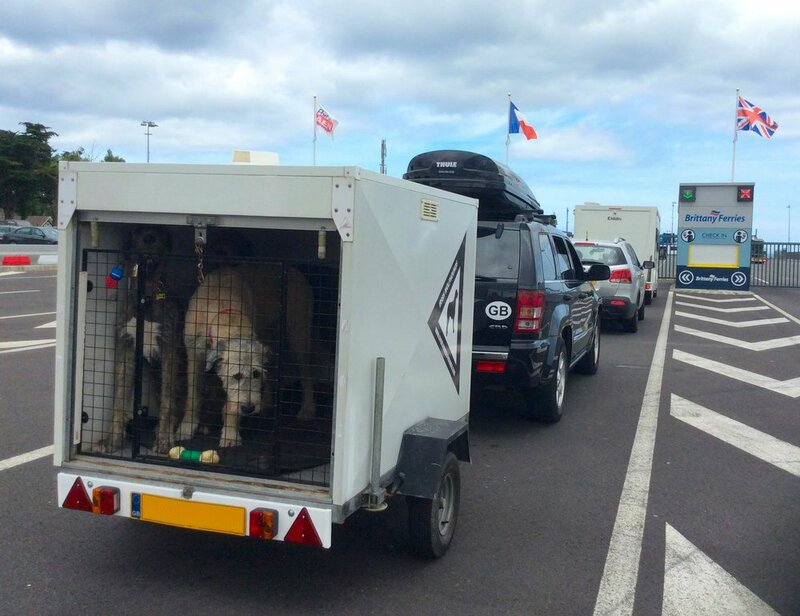 !I drive an estate car as it have lots of room inside, i also have a back gate fitted which allows me to have the boot open when we are on ferries or have stopped for a break so the dogs do not overheat and cant get out. I can actually get all 5 of my dogs in the car but it is a squash!If we are travelling distances we use our dog trailer so they have more room.It is custom built for dogs and they love to go in it. In the house they can reach EVERYWHERE so don’t leave your husbands dinner on the work top unattended as it wont be there when your husband goes to get it! !We have learnt the hard way that the only safe place to leave food is inside a secure cupboard. You can not leave food unattended for a nano second as it will be gone, Ellie and Daisy ate a baguette and a loaf of bread in less than 30 seconds with NO CRUMBS just the empty bags on the floor, and they didnt even look guilty!You will no longer be able to have a bowl of fruit or snacks out because they will just eat it, no matter how high you put it! They are not normally a chewy breed but they do like toys and you will need to buy giant indestructible balls and gnaw bones (like Nylabone) which are the size of an adult males calf bone.They are a lot more expensive than regular dog toys, cheap toys should never be given to your wolfhound as they could choke on the chewed pieces. 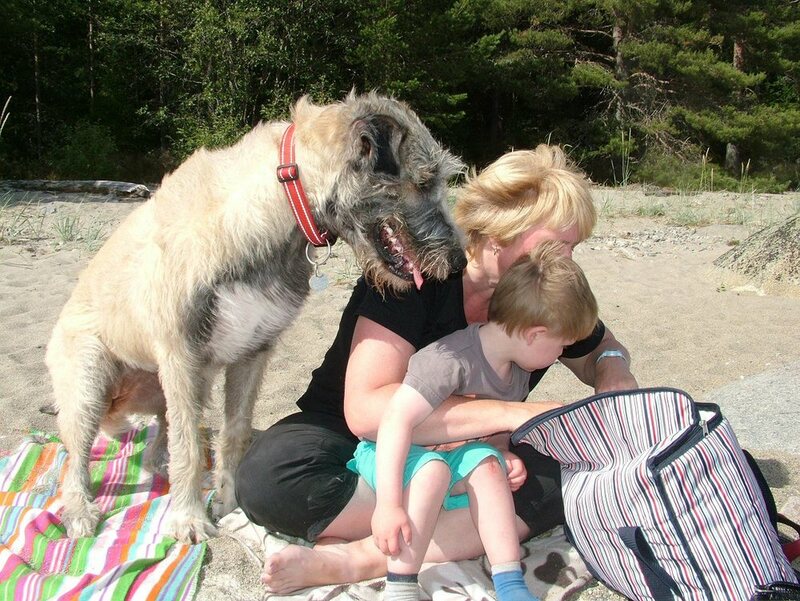 Wolfhounds have enormous feet and if (when) they stand on you it feels like an elephant is on you. Because there feet are big they are able to run across the top of snow unlike our Labrador that sinks in it. If they are outside in snow and ice make sure you check their feet for ice balls that get stuck in the fur and between the toes. The wolfhound is a great dog for a cold climate and doesn’t seem to notice the cold, Ellie is snow mad and loves to roll and jump in it. If they are outside on a hot day they need access to shade and water .We found living in France that the dogs over heated quite quickly and in fact Ellie had a fit caused by over heating even though we had fans and air conditioning. You need to be very careful. If your wolfhound does overheat you need to cool them with cool water sprayed on to their under chest and tummy. We found regular hose downs with cool water helped keep them cool. Wolfhounds are fast growing, once you get your puppy you will only have a few short weeks to pick up and cuddle your puppy before they become too big and heavy. 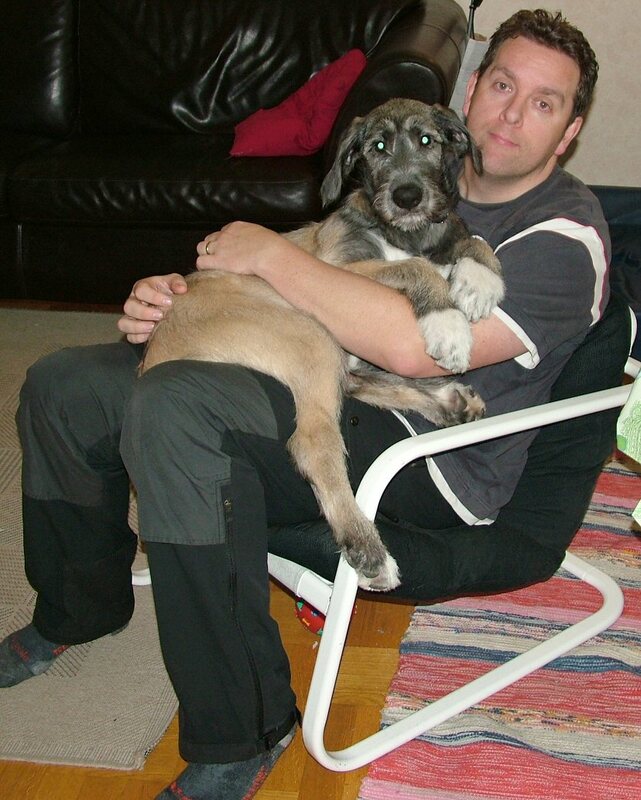 If you need to lift your wolfhound, once it is older than about 8 months forget it. 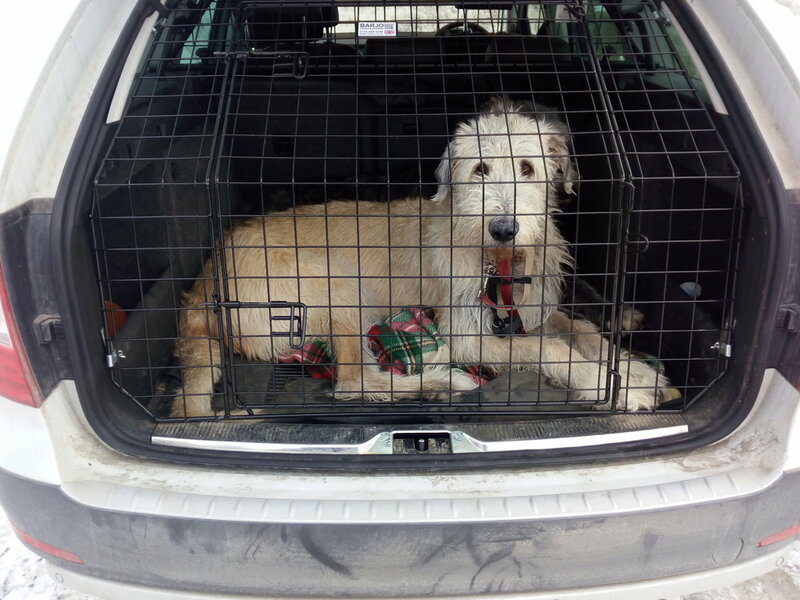 From the start train your wolfhound to get in the car using a ramp (about £100) a telescopic or folding ramp is a good idea as they don’t take up as much room. Make sure it is strong and can take the weight of an adult wolfhound. As they are a heavy breed your wolfhound will need a well padded bed which will support the dogs body and joints. If they lie on a hard floor they will get swellings on their joints especially there elbows. (Hygroma or Bursas are afluid filled swelling of the elbows or rump or hock which look unsightly and are not comfortable for the dog, they should not be treated but left alone to reduce in size but make sure your dog lies on a thick mattress which will support its weight from then on). Do not make the mistake of buying a puppy bed, your wolfhound will have outgrown it in weeks, buy a large one from the start. Wolfhounds are about average to train, they are quite intelligent and can be bribed into doing something for a tasty treat. They are sight hounds so you do need to be vigilant when out walking, if they see something in the distance they could run after it and become surprisingly deaf to your calls. 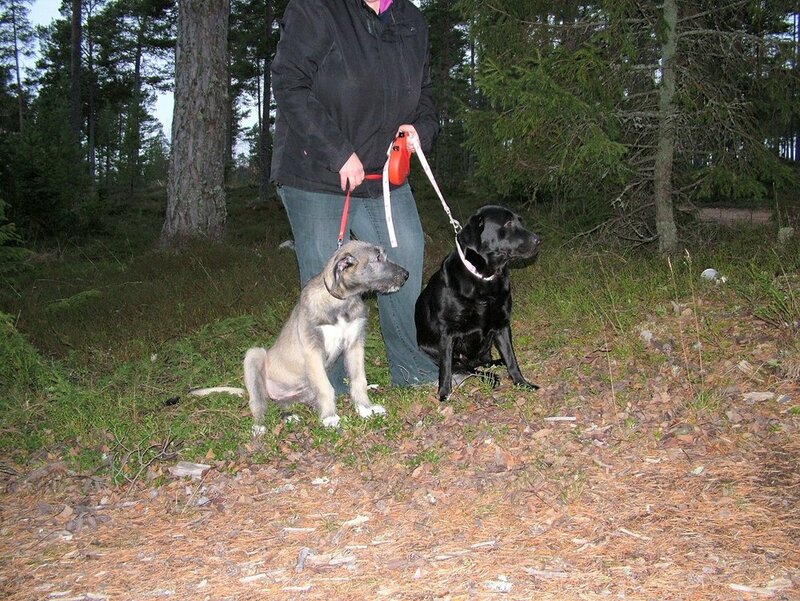 An extendable lead is a good idea when training. 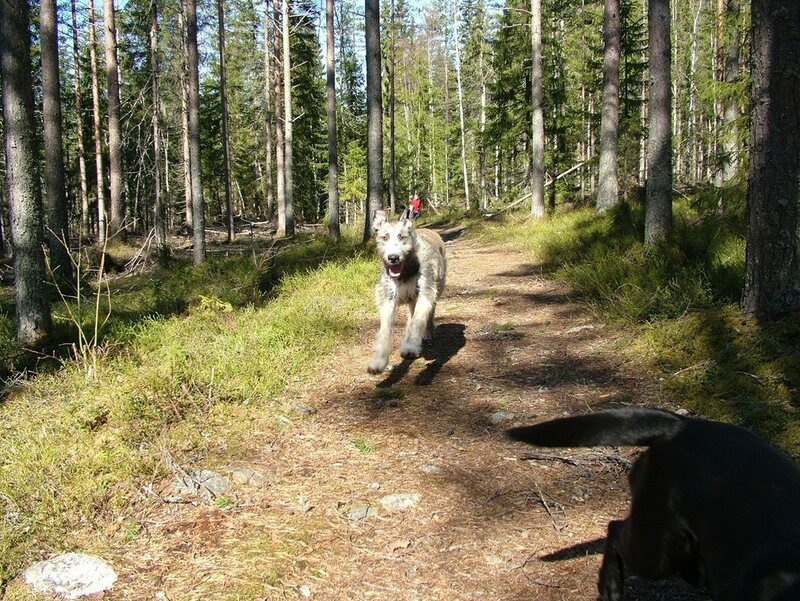 There's a wolfhound coming at full speed! Wolfhounds eat a lot of food, they need a quality food which can be expensive so you need to be prepared for this expense. Wolfhounds eat at least 3x as much as a Labrador. Of course what goes in must come out and if you think a standard dog poo bag is going to do the job, forget it, you need the extra large bags or a plastic shopping bag! Wolfhounds also drink a lot, A LOT, they need a large bowl of fresh water always available, an adult can drink up to 10litres a day! I take the dogs out every hour to relieve themselves because if I don’t and I miss the signs that Ellie needs the toilet she can wee a bucket load in a few seconds , its like a flood. I learnt the hard way. 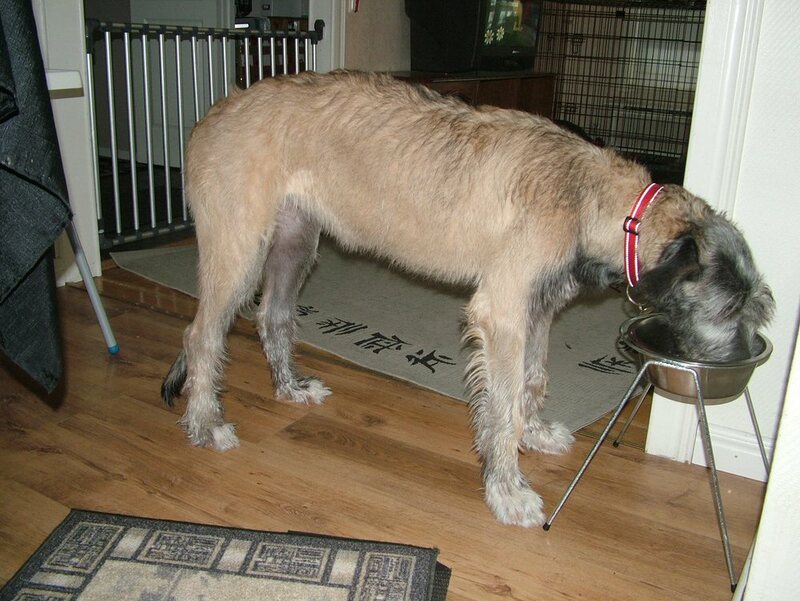 Once your Wolfhound is a few months old you will need to raise the water bowl and her food bowl off the floor, you can buy a raised bowl holder or stand it in a bucket. Wolfhounds are emotionally intelligent, they are very in tune with your mood from an early age. They are sensitive and can get upset. As a handler you must be calm and confident. They can become afraid of silly things like shiny floors, so you must give reassurance and confidence. 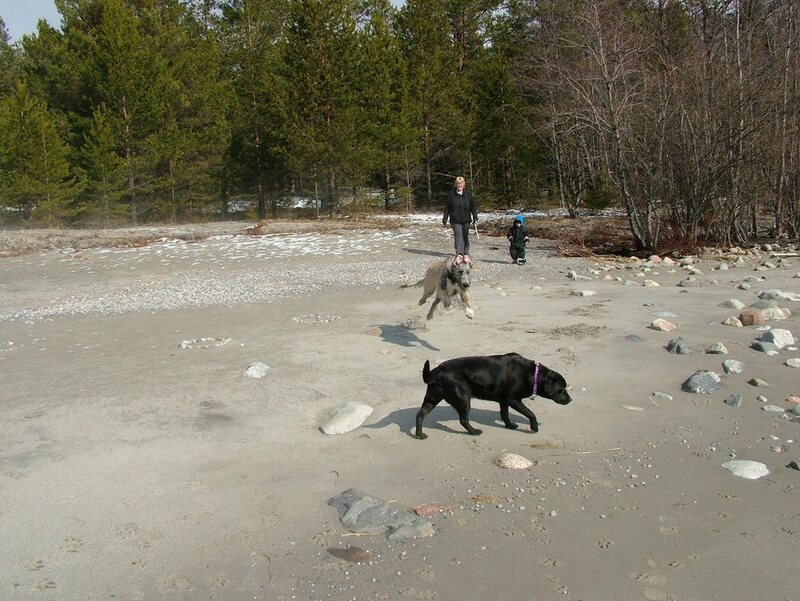 Socialisation is soo important, take your wolfhound to lots of different places and experience new things all the time. Wolfhounds should be taken to busy towns, shops, friends houses, different places for socialisation every day When you are out with your wolfhound don’t expect to get anywhere fast, as people are fascinated and will stop you to talk and stroke your wolfhound. I have been stopped in the street and in the pet shop by people wanting to take Ellies photo ! Of course it’s a lovely way to pass time chatting about your dog. Whats in the picnic bag? 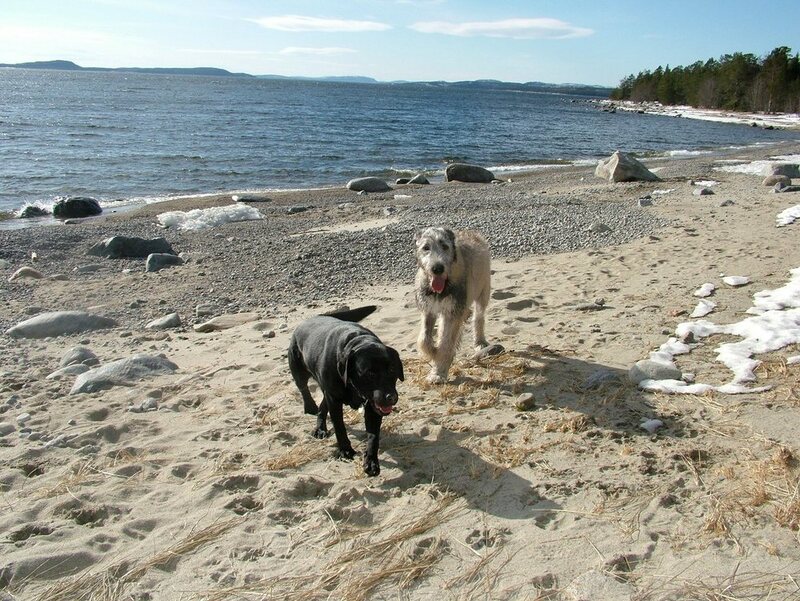 Although Wolfhounds are big you would be mistaken to think they need lots of exercise, in fact quite the opposite especially when growing. As with all fast growing breeds exercise should be limited to prevent damage to soft growing bones. They should be discouraged from jumping and limit free running. A wolfhound puppy only needs a 10 minute walk and 10 minutes free running in the garden. As the wolfhound grows to a year old this can be increased to a 40 minute walk that includes some free running.. It can be quite frustrating to have to limit the dogs exercise like this especially if your wolfhound is full of life but you must be careful not to damage there bones and joints. 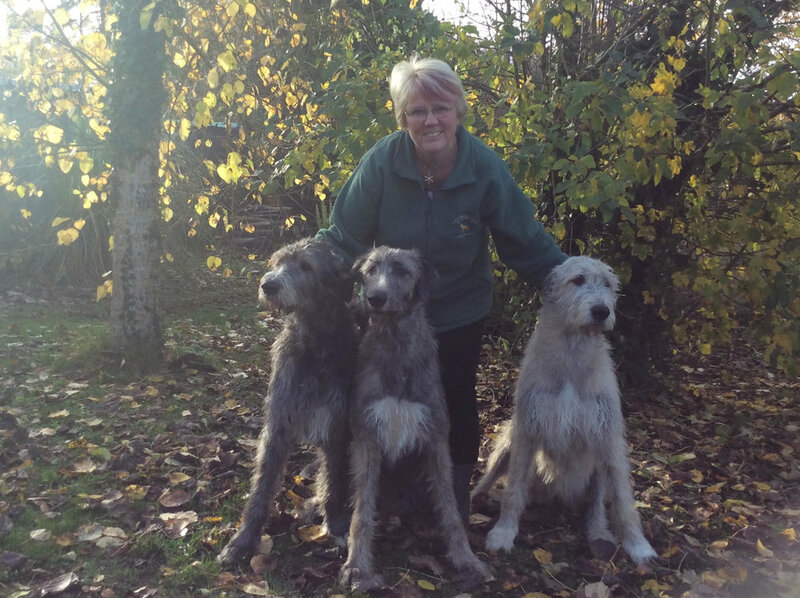 Wolfhounds are very affectionate and need a lot of hands on attention, they love fuss and want to be near you. They are not aggressive but will stand between you and another person if they feel you are being threatened (blocking you). Wolfhounds if left unchecked turn into big hairy dogs so you need to be prepared to spend a bit of time looking after there coat. A weekly brush is adequate but once the coat gets long, the longer dead coat needs to be pulled out. A fully grown adult will take a few hours to strip out but this only needs doing once a year. General care involves brushing the coat and teeth weekly, checking and trimming nails and ear cleaning every couple of weeks. Wolfhound vet bills can be large because they need more anaesthetic and drugs than a smaller breed, insurance could be a good idea. The Irish Wolfhound truly is a magnificent dog, not only in stature but in personality as well. If you have the time, money and space for a giant breed then the Irish Wolfhound is definitely worth considering.